As I may have mentioned in the past, the research group at Grubb & Ellis has been incredibly insightful in predicting this downturn. In fact, present market conditions on track with what the G&E research group predicted back in November of 2007. No other research group, came close to predicting this downturn. That said, let's face it, this financial crisis and the resulting real estate downturn is unlike anything anyone predicted. 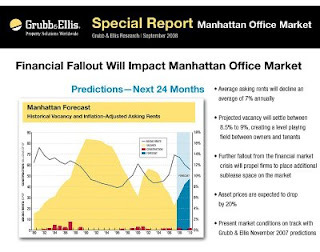 So, with that in mind, I'd like to share with you Grubb & Ellis New York's predictions for the next 2 years. Happy reading!